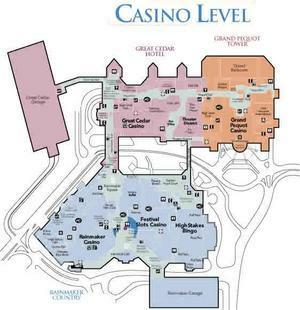 Foxwoods Resort Map. Rainmaker Casino is in lower left hand corner. Connecticut’s two Indian-run casinos say slot machine revenue fell in April, continuing a long-running tumble. Have you noticed the empty spaces where slot machines used to be? Mohegan Sun over the past year has noticeably taken out some of it’s slot inventory making large open spaces. Foxwoods has also done the same. Slot machine revenue has declined at both casinos as customers have reduced spending in the recession and weak recovery and competition becomes more intense with the opening of casinos across the Northeast. Foxwoods Resort Casino has announced plans to cut some hours of operation on a portion of its gambling floor. Foxwoods reported Thursday that the revenue was $39.8 million, down 10 percent from April 2013. Total slot machine wagering at the Mashantucket Pequot tribal casino was nearly $508 million, down 4 percent. The Mohegan Sun reported revenue of $46.7 million in April, down 11 percent from last year. Total wagering was $571.2 million, a 9 percent drop from $627.5 million. Diversification seems to be where both are going to help solidify finances. Mohegan Tribe announced Friday that it has signed a deal with a Harrisburg, Pa.-based restaurant chain to open at least 15 franchised restaurant locations throughout New England over the next five years. Under the agreement, the tribe will open the first Arooga’s Grill House and Sports Bar on reservation land adjacent to Mohegan Sun, the tribe’s flagship casino. This after a year of taking over management of Resorts in Atlantic City. Foxwoods is also on the move. While continuing it’s hefty project of the Tanger Outlet Mall. The outlet mall will focus on luxury brands and will be between the Grand Pequot Tower and The Fox Tower, formerly MGM Grand at Foxwoods, scheduled to open in May 2015. But, according to WFSB, Foxwoods Casino will be cutting hours at one of its six casinos on its campus. The Rainmaker Casino will be closed from 4 a.m. on Mondays until 9 a.m. on Fridays beginning June 9, 2014. Tough times over the last two years for both CT casinos still haven’t diminished CT as the highest ranking Tribal Casinos in the country in revenue made. With Massachusetts possibilities looming ahead for both, and Upstate New York ventures being promoted, and local diversification, the best could be yet to come. Steve Wynn in Massachusetts – What’s Your Deal?